It is very likely that phone lines will be busy or unavailable during a natural disaster. Don’t expect that you can rely on being able to call emergency services right away. This is why disaster plans should have valuable pre-disaster communications and strategies to address the issue. Short range radios and walky talkies are a good way to negate this issue for on-site communication. If your company doesn’t already have a disaster plan, or doesn’t take disaster planning seriously, then you are setting yourself up to feel the full force of a natural disaster when it does occur. Don’t take a lack of disaster events in the past to mean that you are totally safe in the future; take your disaster planning seriously. Internal and external call lists, as well as employee training, all need to be kept up to date, just as you would keep first aid training up to date for employees. Don’t rely on a “once in a while” training regimen, or on simple fire drills to make sure everyone will know what to do. 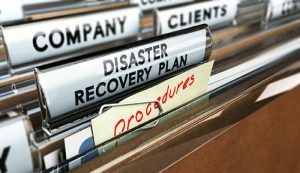 Disaster training courses are available from state and local agencies, as are crisis consultation firms that can help you to form an appropriate disaster plan. Along with planning, delegation of tasks and prioritization of objectives can be crucial in avoiding serious damage. Delegating tasks to the right individuals in the right areas of a commercial property can be something as simple as checking to ensure certain doors are locked and secure, and it can be as involved as spot checks on hazardous materials and emergency security protocols. Whatever those plans may be, make sure the right people are carrying them out. Every six months, inspect the premises for potential environmental concerns, faulty equipment, and other sources of damage or risk so that they can be addressed, and so you can avoid costly damage should a disaster occur. Medical care facilities have their own back-up generators, but not every business has them, while there may be others that need them. Chemicals and materials that need to be kept under refrigeration, facilities that handle potentially biologically hazardous materials, and more, may have a strong priority placed on back-up power sources. Going hand in hand with delegation, leadership during an emergency can make the difference in terms of communication and cohesion of plan. Have a designated leader for individual floors of a building, and for an entire property, so communication can be easily relayed and information can be kept updated throughout a disaster. Depending on the nature of the disaster, drinkable water may be in short supply. Events like flooding can introduce biological hazards that can compromise drinking water sources. Keep a viable and commercial vetted water filter on site. Along with regular inspections of the building, seasonally specific inspections of systems like your roofing and your plumbing are vital. These are areas of a building that are vulnerable to damage during the winter, and if left neglected, can be sources of unwanted water entering the building. A properly inspected and functioning HVAC systems is also crucial. Finally, remember that emergency response agencies will be stretched to their limits during a natural disaster. Issues like site security, water damage clean-up, and more will need to be handled by companies specifically trained in those areas. The best way to ensure they are available for you is to have a PREP (Priority Response Emergency Plan) in place with the local, trusted PREP Certified contractor!